I left Muncie on Saturday morning at around 9:30 and drove through a torrential downpour until I arrived at around 7 PM in Kennasaw, Georgia. I stopped at a Starbucks and looked online for a hotel. I used Priceline for the first time and was pleasantly surprised to find an $80 hotel room for $40. And it was nice with its little kitchenette and powerful shower. The only bad things about it was being able to hear every car that passed on the water-logged road outside the hotel. There was a constant swishing sound that occasionally was accompanied by the engine breaking of large trucks as they descended the hill. I slept well, but before I went to bed I ate some of the best Thai food I’ve ever had. Though I will never learn not to order things extra spicy when I eat at an Asian restaurant that doubles as someone’s house, I was able to sleep despite the nice burn that lingered in my acidic gut. 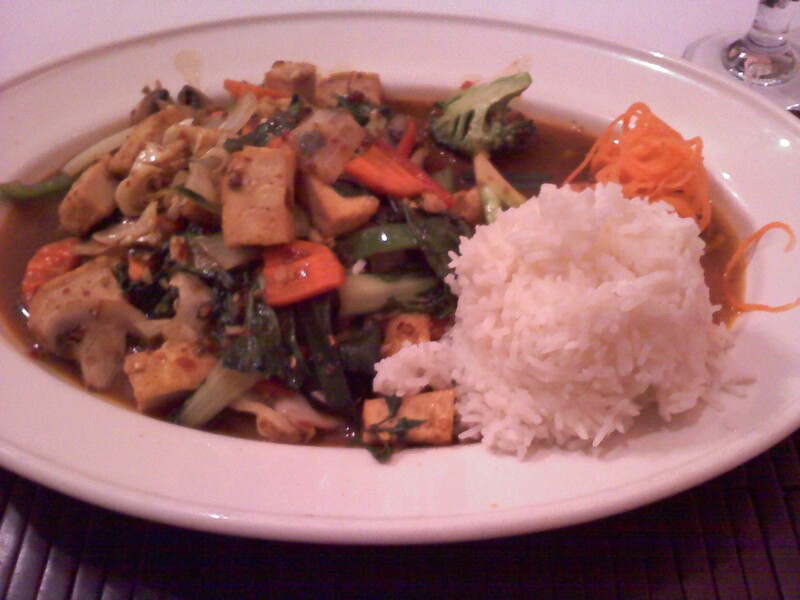 I had Spicy Thai Vegetables with Tofu at Bangkok Cabin. They were hotter than hell, if I believed in hell, but so delicious. I tried to enjoy myself on the way down to Florida. I listened to the bible up through Ezra, to which a friend responded, “I don’t know if that makes me love you, or makes you insane.” Both. I also listened to Monster by Walter Dean Myers and tons of music. The last thing I really remember listening to was an excellent sermon by Alistair Begg about the authority of scripture; he encouraged his listeners and his congregants to always question and double-check what they hear from his pulpit. I heard it somewhere in northern Florida, which is appropriate since the stretch from Atlanta to Orlando has probably made some people lose their faith. This entry was posted in Food, Religion, Vegetarian or Vegan. Bookmark the permalink.